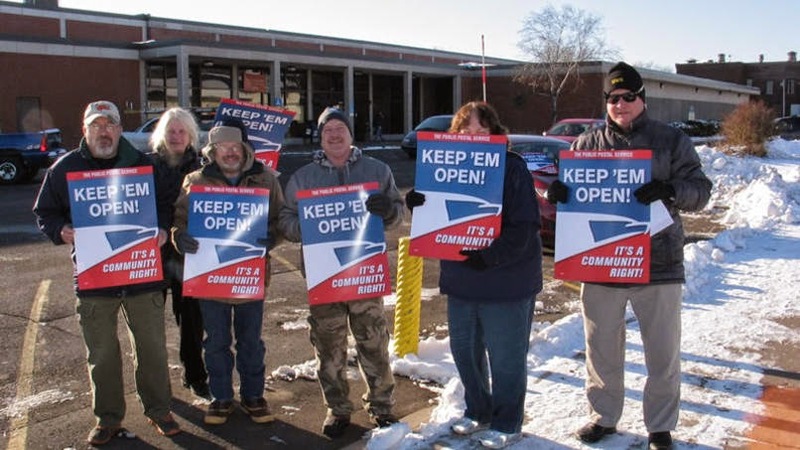 Members of the Greater Northland Area Local 142 of the American Postal Workers Union joined postal employees across the United States Friday, Nov. 14, in another National Day of Action against their employer, the U.S. Postal Service. Leafleting at Duluth’s Main Post Office, the workers’ action was to tell Postmaster General Patrick Donahoe and the USPS Board of Governors: Stop Delaying America’s Mail! Donahoe, who is said to be close to retiring, is poised to make devastating cuts in service to the American people – cuts so severe that they will forever damage the U.S. Postal Service say postal unions. -On Jan. 5, the USPS is slated to lower “service standards” to virtually eliminate overnight delivery – including first-class mail from one address to another within the same city or town. -All mail (medicine, online purchases, local newspapers, church bulletins, letters, bill payments, invitations) throughout the country will be delayed. -Beginning Jan. 5, 82 Mail Processing & Distribution Centers are scheduled to close and Duluth has been on the closure list for many years. All mail now processed in Duluth would be sent to Eagan, Minn., (south of St. Paul) for processing and then sent back north to be delivered. Not only will that be a huge loss of jobs, about 80, it will delay mail drastically. You can forget about first class mail being delivered overnight says Gayle Bender, a long time APWU member in Duluth. That’s the way the Postal Service was set up and guaranteed in the U.S. Constitution. But in what has appeared as an effort to privatize the service, management is saying cost cutting measures are required. These cuts will cause hardships for customers, drive away business, cause irreparable harm to the U.S. Postal Service, and lead to massive schedule changes and reassignments for employees say the unions. They are part of a flawed management strategy that has unnecessarily sacrificed service and failed to address the cause of the Postal Service’s manufactured financial crisis. -Six-day delivery and door delivery are under constant threat. You may have to go to the end of your block to a cluster of mailboxes to retrieve your mail. In fact, the USPS has earned more than $1 billion in profit from operations this year. It doesn’t use a dime of taxpayer money. The “losses” or red ink management uses as their excuse for cuts stems from Congress and a law signed by President George W. Bush in 2006. That law requires USPS to pre-funding retiree health care benefits for the next 75 years in the next 10 years. That costs the USPS $5.6 billion a year – for future employees that haven’t even been born yet. The costs have nothing to do with the cost of collecting, sorting and delivering mail. The leafleting on the day of action Nov. 14 asks postal customers to call their Congressional representatives and tell them to support the moratorium on plant closings so the postal service can continue to serve communities. So far 51 senators and 160 House members support a one year moratorium. The US Postal Service is always the most revered federal agency in surveys of the American public. Postal unions say there are many other ways to generate revenue rather than the proposed cuts, some things as simple as ending the ban against mailing liquor. You can find out more at StopMailDelays.org. > The article above was written by Larry Sillanpa of Labor World newspaper, and is reprinted from the WorkdayMinnesota website.